The data frame displays a collection of layers drawn in a particular order for a given map extent and map projection. The table of contents on the left side of the map window shows the list of layers in the data frame. Each layer in the data frame is used to display information from a dataset (such as a feature class or an image file). The table of contents lists the drawing order of each layer. You work with features, rasters, and layers within the data frame in ground units (using feet, meters, and so on). When you create a map, it contains a default data frame listed in the table of contents as Layers (you can rename it if you want). In data view, the display window is the data frame—showing the map layers of the active data frame drawn according to their order in the table of contents from bottom to top. 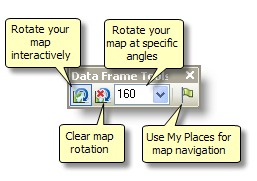 While in many maps, you'll only need one data frame, you can add more data frames by clicking Insert > Data Frame on the main menu. You can remove a data frame by right-clicking the data frame name in the table of contents and selecting Remove. A map must have at least one data frame. You can't delete the last data frame on a map. When a new data frame is added in ArcMap, it appears in the table of contents and is highlighted as the active data frame. When your map document contains more than one data frame, you will have one that is the active data frame; that is, the one you are actively working with. The active data frame name is shown in bold in the table of contents. To make a data frame active, right-click on its name in the table of contents and select Activate. When you have more than one data frame and add layers to the map, they're added to the active data frame. You can move layers from one data frame to another by selecting them and then dragging them into the target data frame. 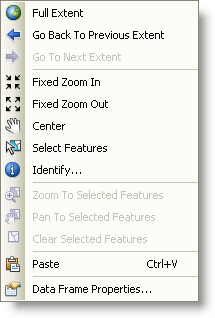 In addition, right-clicking in the data frame displays a context menu of data navigation tools. Right-clicking inside the data frame view displays this context menu. Smooth, continuous panning and zooming can be turned on and are productive, especially when using basemap layers. Analyze your map for drawing performance. Use basemap layers to compute layer display once and reuse it during your ArcMap session. Use hardware acceleration for basemap layers and accelerated raster layers to further improve interactive display performance. Right-click the data frame's name in the table of contents (or the data frame on the layout). Click Properties and click the various tabs to view and set data frame properties. You can set and review various properties under each tab on this dialog box. The coordinate system is one of the most important properties because it defines the map projection for the data frame. Typically, the coordinate system of your data frame is determined by the coordinate system of the first dataset you add to your map. All other added datasets will be projected on the fly to match the coordinate system. 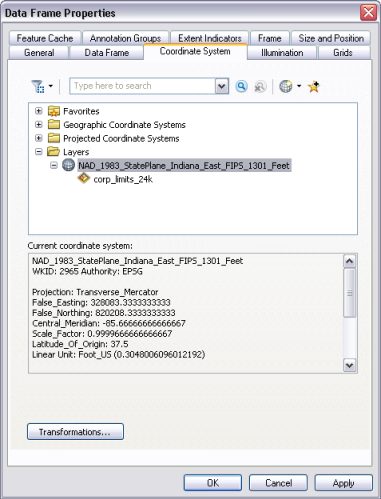 You can review and set the data frame's coordinate system from the Coordinate System tab on the Data Frame Properties dialog box. In addition, other properties can be set from this dialog box. 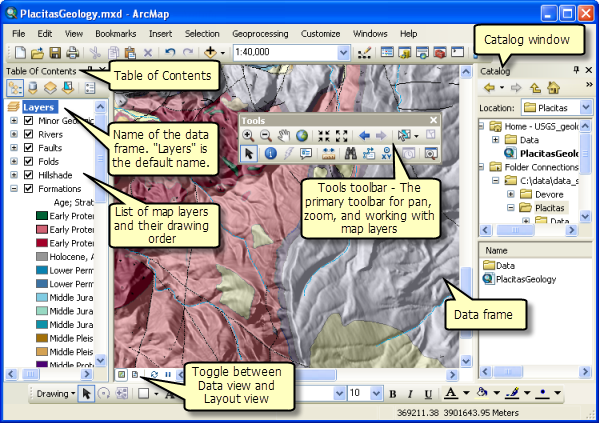 These include adding grids and graticules; setting the full extent of your map window when you click the Full Extent button; creating and managing a feature cache to boost performance across a network; and setting appearance properties such as the position of the data frame on the page, borders, and background. 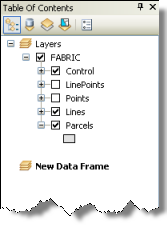 See Working with data frames in page layouts for how to use many of the tabs on the Data Frame Properties dialog box. You can set a specific map scale at which to view data in your map frame using the Map Scale drop-down list on the main menu. 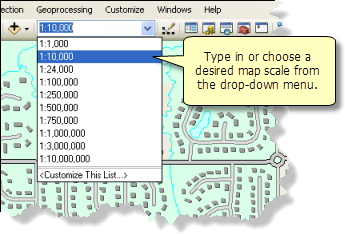 Type in the desired map scale or choose one from the drop-down list. See Working with map scales to learn more about working with map scales in ArcMap. Bookmarks provide a way to locate specific areas on your map that users can navigate to easily. 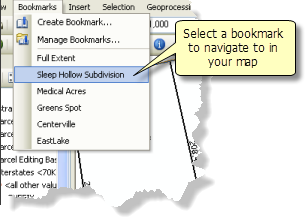 When you are using ArcMap and find an extent that you want to mark, you can add a bookmark to your map that will make it easy for others to find it later on. See Using spatial bookmarks for more information. The Data Frame Tools toolbar is available for working with data frames. You can open this toolbar by clicking Customize > Toolbars > Data Frame Tools on the main menu. Using these tools, you can rotate your map contents in the data frame and use a collection of your own places (My Places) for map navigation. See Using My Places for more information on using place-names to navigate around your maps.